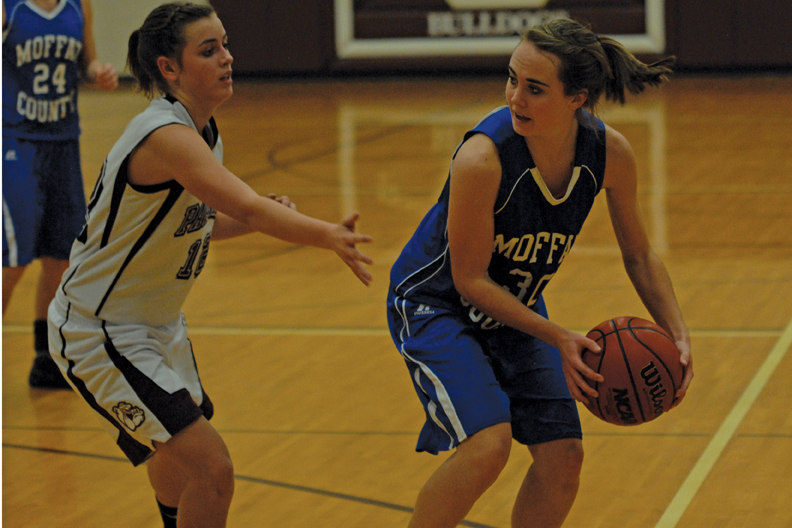 Maddy Jourgensen, a Moffat County High School senior, pivots and gets ready to pass during the Bulldogs’ game against the host team of the Palisade Tournament. Head coach Matt Ray hopes to prepare his squad as it prepares to begin league play Jan. 8. After opening the season 6-4, Moffat County High School girls varsity basketball coach Matt Ray is still pushing his girls to work hard and improve. The girls team practiced most days this week and will continue next week during winter break. Although Ray described his team as well-rounded, he said the Bulldogs’ biggest weakness is patience. The team has played in three tournaments thus far in the season. MCHS went 2-1 in the Uintah High School Tournament, 1-2 at the Steamboat Springs Shootout, and 2-1 at the Palisade Tournament. Three of the four losses the team has suffered this year have been by a combined 11 points. Again, Ray said patience plays into the equation. On his roster, Ray has five seniors — Nike Cleverly, Brittany Ivers, Maddy Jourgensen, Callie Papoulas and Lauren Roberts. Because of those seniors, Ray said he has had to coach a little less. For the underclassmen, Ray said he has been pleased with the way they have stepped up. When the girls return to play Jan. 8 against Glenwood Springs High School, Ray said the team will start on one of their top goals — winning the Western Slope League.